Servindi, december 8, 2018.- A strong rejection of the so-called Law of Fracking in Peru made the indigenous delegation of AIDESEP at the Climate Summit COP24 held in Katowice, Poland. Delegates of the Inter-Ethnic Development Association of the Peruvian Forest (AIDESEP) gave out a statement in Spanish and English that has aroused the specialized press interest. The projects of Law 98/2016-CR, 1525/2016-CR and 2145-2017-PE are denounced for violating the Amazonian life, the rights of the indigenous peoples and "ridicules the social and environmental institution of the country”. 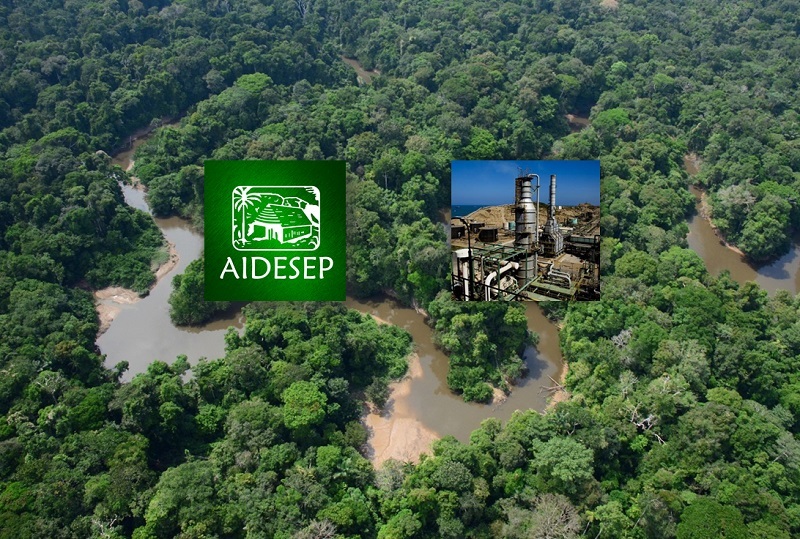 AIDESEP accuses the project of blocking the transition to clean and renewable energies; meanwhile, it reinforces the dependence on fossil energy. Hydraulic fracturing or fracking is an unconventional technique to extract hydrocarbons by breaking down deep rocks, mixing toxic water with underground aquifers and causing volatile toxic gases. Forbidden in different parts of the world, fracking has already destroyed the basins of the Marañón, Tigre, Corrientes and Amazonas rivers and it is sought to strengthen and apply it in new regions. AIDESEP regrets the weakness and silence of the Ministry of the Environment, the Ministry of Culture and the Ombudsman in the face of this imminent danger. It also calls on indigenous, youth, environmental, cultural, trade union and political actors to join forces “to ban the inferno of fracking in the Amazon”. Finally, it proposes to promote “another economy of full life and not of death, with added value of standing forest and clean, renewable, responsible and sustainable energies”. YES to an Amazon with an Economy and Life Energy and not to death! YES to the national change towards renewable and clean anergies! For more than 40 years, the hidden crime in the Amazon has been operating, we reject this to continue. It is the technology of extracting hydrocarbons, entering to several kilometers of the subsoil, breaking the "mother rocks" with "chemical pumps" of millions of liters of water with 600 chemical additives, 29 of them carcinogenic (like Radon) and others affecting the brain (55% of them), lungs, liver (72%), endocrine system (44%) and 44% not yet studied in their impact. It is about the "hydraulic fracturing or hydro fracturing unconventional hydrocarbons" (predominating methane, 23 times worse than CO2). Called "Fracking", banned in other countries it is permited in Peru and it continues to kill indigenous and the Amazons. The basins in the north of the Amazons have been destroyed, thousands of indigenous people with degenerative toxins for life, and the State continues to deceive with ridiculous "actions" and "compensations". Most deposits and lots of hydrocarbons require Fracking and we will not accept that this crime against the Amazon, our peoples, and humanity continues. We hold the State responsible, Ministries of: Energy and Mines, health that do not pronounce anything about it and the politicians who cover it up. Lobby project from some enterprises. It was born with the "pretext" of attracting capital for the hydrocarbons sector and responding to private profit-making purposes, encouraging the use of dangerous extraction techniques such as fracking or hydraulic fracturing, of serious and irreversible socio-environmental impact, which is added and accumulates to the 50 previous years of toxic disasters unpunished. Blocks the transition to clean and renewable energies. It reinforces dependence and "addiction" to fossil energy, which the Amazon and the planet cannot bear. Thus, it blocks an urgent change of matrix and formulates a clean energy policy that benefits the country, because it is sustainable, of lower cost, complies with climate commitments so that they do not remain on paper. Peru to the future with the effectiveness, efficiency and sustainability of solar, wind and other energy, avoiding large hydroelectric and biofuels, and their social and environmental damages. Fraking imposes death. Rupture of deep rocks, mixing toxic water with underground aquifers, volatile toxic gases, acid rain, biodiversity and human health, in an eternal vicious circle of contamination. It has already destroyed the basins of Marañón, Tigre, Corrientes, Amazonas forever, with serious damage and social conflict, and these same toxins go through the pipeline, affecting other areas with their unstoppable spills. There is no self-criticism; fracking rules (DS 032-2004-MEM) subsist, and it seeks to impose and institutionalize it despite being PROHIBITED in the world, cutting environmental institutions, degrading human life and the Amazon itself, multiplying the impacts of the global climate crisis about Peru. Excludes debate and imposes itself dictatorially. It is not the result of a broad debate or national consensus among all involved. The law has opened its own way, responding to personal interest; and even putting pressure on the opinion of ministries and regional governments. Weakens environmental institutions and violates rights. It implies a reduction of social and environmental obligations and a weakening of environmental institutions, which causing more aggression to the one that is already threatening the Amazon and the rights of our peoples. We regret the weakness and rapid silence of MINAM, MINCUL and Ombudsman. Violates international treaty. The Energy and Mines Commission and the government disregard the consultation and free, prior and informed consent provided by ILO Convention 169 (the treaty in force since 1993) as was the case with the forestry bill in 2011, demonstrating the falsity if more "previous rules" are required. AIDESEP calls for indigenous, youth, environmental, cultural, trade union movements and political actors to join forces to ban the inferno of fracking in the Amazon; reject bills on hydrocarbons; and develop alternatives to the unsuccessful extractive model dependent on fossil energy in the Amazon; promoting another economy of full life and not of death, with added value of standing forest and clean, renewable, responsible and sustainable energies.